Yarmouth-Freeport hosted York December 27th and were unable to come out with the victory in OT, giving Yarmouth their second loss of the season. 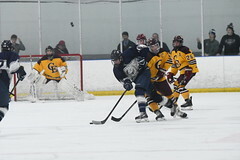 Despite several scoring opportunities and plenty of shots on net in the first period York got on the board first seven minutes in and followed up with a second goal with thirty second left in the period to give York a 2-0 lead. 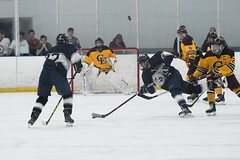 Yarmouth-Freeport created scoring opportunities and dominated the offensive zone for a majority of the second period but were continuously denied by York goal tender. Seven minutes into the period York took a checking penalty and tipped the puck into their own net giving Yarmouth-Freeport the power play goal and brought the score to 2-1. The goal was credited to sophomore Lily Caulfield who was in front for the scramble with assists going to sophomore Emma Moll and senior Kyaira Grondin. Yarmouth-Freeport continued to attack York and pepper their goalie and tied the game at two apiece with 1:46 left in the second by senior Lydia Guay who picked up the puck off a face-off win from freshman Olivia Bradford and put it top corner. The third period saw more offensive power from Yarmouth-Freeport but the girls were unable to put the puck past the York goalie. York had a power play opportunity four minutes into the period because of a too many players call for Yarmouth-Freeport but was unable to score. With 1:13 left in the period Guay is sent to the box for tripping and York was given another power play opportunity. 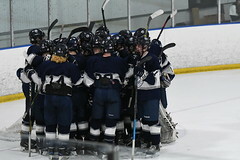 Yarmouth-Freeport worked hard on the penalty kill and the game ends 2-2. Yarmouth-Freeport was able to kill off the rest of York’s power play in over time but York snuck a shot past sophomore Allie Perrotta from deep in offensive zone and York takes the win, 3-2. Yarmouth-Freeport headed to Lewiston December 29th to face top seeded (north) and undefeated Lewiston/Monmouth team. Yarmouth-Freeport held their own against a very fast and talented Lewiston/Monmouth team, allowing one goal in the first and two in the second. Lewiston/Monmouth took advantage of the high slot in the third period and scored seven goals, final score 0-10. The Yarmouth-Freeport girls hockey team defeated Brunswick in their first game of the new year with great teamwork and goals coming from six different ladies. Senior Margaret Perrotta scores 3:27 into the first period with a hard shot from the high slot after receiving a pass from sophomore Lilly Weinrich. The first period ended with both teams at six shot apiece on net and Yarmouth-Freeport with the 1-0 lead. Yarmouth-Freeport only allowed two shots in the second period, both turned away by sophomore goalie Allie Perrotta. Sophomore Emma Moll gave Yarmouth-Freeport the 2-0 lead with a shot from the goal line at 9:53 with help from sophomore Lizzie Guertler. Junior Sophie Newberg then picked up the puck deep in the defensive zone and drove down ice, took a shot on net which was retrieved by Perrotta, passed to Weinrich who shot and Newberg scored on the rebound to give Yarmouth-Freeport a three goal lead to end the second period. Six minutes into the third period Weinrich scores with help from sophomore Hannah Swift quickly followed by Moll’s second goal of the night giving Yarmouth-Freeport a 5-0 lead. Continued pressure in the offensive zone draws a penalty 11:00 minutes into the third and Yarmouth-Freeport goes on the power play. Newberg is given a pass at the blue line and able to get a slap shop off which was tipped into the top corner by senior Lydia Guay to for the power play goal, making the score 6-0. Swift gets one more for Yarmouth-Freeport with 1:12 left in the game, assisted by Moll and the game ends with a 7-0 victory for Yarmouth-Freeport. Perrotta gets the shutout facing ten shots total.